This chapter was edited by Kiyara! Awesome guy, he is. Gongson Chun Gi massaged his head, and a painful moan came out of his throat. The wrinkly old man. He was one of the 8 guardians of the church, the harmonious expert Ju Sang San. He sweated a bit and started glancing towards Guardian Wu. Seeing that, Gongson Chun Gi glared at Guardian Wu. Guardian Ju started to nod vigorously. Guardian Wu frantically began trying to explain himself with a pale face. Guardian Wu and Guardian Ju. The two bowed down fearfully. That was because Gongson Chun Gi had left his usual playful attitude behind, and was raging at the old man. Guardian Ju, a member of the fifteen guests known as the Blood Sound Demon (血音魔君). The reason Gongson Chun Gi was angry wasn’t just because he came here. If Guardian Ju had come alone, Gongson Chun Gi would’ve greeted him happily. But the problem was, he didn’t come alone. He brought two of the ten martial groups inside the Heavenly Demon Church. Guardian Wu brought 500 of the strongest experts, the Blood Wolf Corps. Guardian Ju brought the Wind Demon Corps (風魔隊) and the Yama Corps (閻羅隊), which totaled 4000 men. If you would add the 500 experts stationed in the Gansu branch, the grand total of the martial artists currently in the Gansu branch would become an astonishing amount of 5000 men. The Gansu branch obviously couldn’t house that many people. Because of that, they had to set up tents to accommodate the experts. When Guardian Ju said this with a cautious voice, Gongson Chun Gi wrinkled his face. Since the men at the Blood Wolf Corps were the elites of the church, they could easily get themselves out of a tight situation. Even if they were stuck in an extremely dangerous area, they would get out without much injury. But when the Wind Demon Corps and the Yama Corps, both weaker than the Blood Wolf Corps, join in, the whole story would be different. Their mobility would obviously decrease. Gongson Chun Gi had to abandon the idea of running away. His face stiffened. He didn’t want to fight, but only on the condition that they would suffer no injuries. He had no desire to avoid a fight by giving up their own flesh and blood. The fact that the church had to go into a battle with the Alliance bothered Gongson Chun Gi greatly. Um Seung Do entered the meeting room politely. Looking at Um Seung Do, Gongson Chun Gi spoke. Um Seung Do cautiously asked a question. Gongson Chun Gi shook his head. Gongson Chun Gi made a depressed expression. A lot of people were going to die here. It would be a different story if they had an absolute advantage against the enemy, but they didn’t. Both sides would suffer from great losses in this case. Um Seung Do hesitated a little at this question. He didn’t know what kind of an answer the Pope wanted. Because of that, Um Seung Do tried to be as cautious as possible as he answered the question. The price of a martial arts technique in the martial world was immense. Especially a martial arts technique that had the capability to shake the world. When a martial arts technique of that much value appeared, every martial artist in the world would try to get it using any means possible. Gongson Chun Gi pressed down on his aching temples, and spoke. The battle would happen in four days. That would mean that the church would have to hold on for seven whole days. Just how should the church accomplish that? If he just followed his personality, he would’ve done that a long time ago. But he couldn’t do it. If he did that, something that he didn’t want to see happen the most would happen. A lot of people would die if he did it. While Gongson Chun Gi was trying to think of some kind of a solution, Um Seung Do spoke up. Gongson Chun Gi nodded. Come to think of it, nothing good happened since he came here. Except for meeting the boy. That was the only good thing that had happened to him so far. When he thought that much, his terrible mood lightened a bit. When Gongson Chun Gi went outside the meeting room, Guardian Wu and Guardian Ju both sighed in relief. Immediately after that, Guardian Wu began to growl at Guardian Ju. When Guardian Ju said this, Guardian Wu’s face started to look more and more dangerous. Guardian Wu and Guardian Ju. They were old rivals, as well as friends. After fighting each other like that for a while, they looked down at their wrinkly hands and grinned. One could feel quite a bit of determination in that voice. Looking at Guardian Ju, Guardian Wu spoke with a sad face. He thought of something from the past, and spoke. Looking at Guardian Ju, who had a mysterious smile on his face, Guardian Wu’s eyes began to narrow. Guardian Wu grabbed Guardian Ju’s shoulders violently. The two old friends looked at each other, and laughed. Um Seung Do, who had been hiding in the room all this time, felt that this wasn’t the place for him and tried to sneak out. Did that tick them off? Guardian Ju called out to Um Seung Do. A silly question? What was it? While Um Seung Do was trying to look over the previous situation, Guardian Ju spoke. He remembered that question. But just what was wrong about it? Guardian Ju spoke after reading Um Seung Do’s face. But that was just a prediction made by the church. Even though he did believe in the power of the church, but since he mainly dealt with information as a job, he usually had to suspect everything unless it was certain. Guardian Ju spoke whilst having his arms folded together. When Guardian Ju asked this, Um Seung Do answered back with a slightly offended expression. Um Seung Do began thinking. Even though His Holiness was quite strong, the Alliance’s chief wasn’t an easy foe. They were both a part of the three sovereigns, after all. So what would happen if they both entered the battle? Nothing would change, right? Guardian Wu, who had been staying quiet all this while, opened his mouth. Um Seung Do opened his mouth, then closed it again. What? It’s not even a 90%, but a full 100%? That would mean that the church would have no casualties at all, but was that even possible to begin with? It seemed that these old men had a bit too much loyalty in them. They had to look at situations like these as coldly as possible……. Um Seung Do’s eyes began to show a tinge of disappointment. 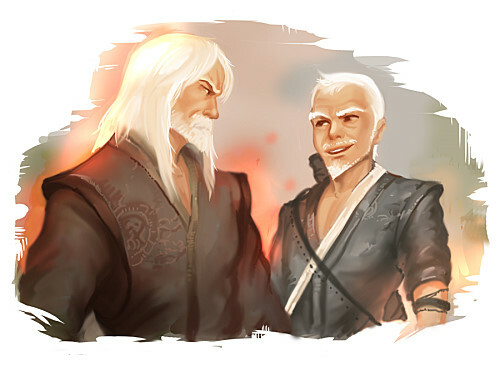 When Um Seung Do saw the two old men, who were glancing at each other with a smile, his face began to get complicated. It seemed that they knew something about His Holiness that he didn’t know about. As a person who handled information, not being able to predict the power of his own allies and the enemies was a critical problem. He couldn’t figure out what was going to happen in the future right now. There were too many variables in play. At times like these, it was better to just try to crush the enemy with pure force, rather than to try to come up with a decent strategy. Um Seung Do felt his blood boil when he thought about the war. After all, he too was a martial artist. There hadn’t been anything as big as this recently. Just what would happen? Um Seung Do forcefully tried to cool his head as he stared out the window. Then, Guardian Ju opened his mouth with a confused expression. Guardian Ju’s movements stopped for a split second. He then widened his wrinkly eyes and shouted. Guardian Wu couldn’t say anything else. That was because Guardian Ju was already gone. I’m betting Guardian Ju will do something unnecessary that will further irritate the pope and alienate the MC. It seems to be the pattern of the pope’s closest subordinates. I wonder how long it would take for the MC to take the formation apart? I think it might already be done if he wasn’t being distracted by all this disciple stuff. I don’t think it’ll be that easy for him if he’s alone but he have Mr Zhuge in his head. If that old dude feel like helping him it’ll only take a few hours I think. If he helped, it would probably take seconds. I wouldn’t be surprised if it was originally one of his formations after all. Cool, story is heating up. Thanks for the release! Martial art that makes you want to kill people… Is he Sylar? where is Sylar from ( is he from a novel /and what novel ? )? Thanks! Lol, the interactions between those two Guardians are hilarious! Nice friendship they have there! also, good for you, translator ensj, for finding a wonderful editor friend! Hi Kiyara! Hope you’ll continue being the editor until the end! Haha! Hey, a new reader here. I currently read to chapter 2, and I gotta ask, is Zhuge Liang suppose to be address as chancellor? I know a bit about the three kingdom thing I think, I not sure if I got the right series. If I right about the right the series, then Zhuge Liang is a really famous scholar and a heavenly strategist. Although, I know of the three kingdom throught reading Vietnamese blog so I hope you forgive me if I mistaken something. I blame the Vietnamese translator :D.